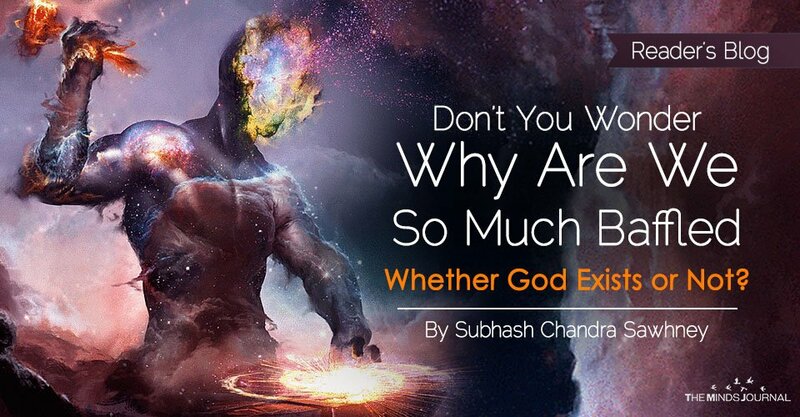 Don’t you wonder why are we so much baffled whether God exists or not? We have been able to find out that there are billions of stars even in our galaxy and there are probably billions of such galaxies that surround our galaxy but we have not been able to locate the God as yet despite having been given so many clues by the people who should have written Vedas thousands of years back. Let us look at the clues they gave us – one by one, beginning with the clue that he is “formless”. If we look at all type of things, we may rule out the solid things outright since they are not formless. Liquids are also not formless. So we need not look for him in anything that may be in a liquid form either. However if we looked at the gases, we know – they are formless. But they also told us that we can’t see him through our biological eyes. So we may strike off the flames from our list. As for seeing, we know pretty well – we can’t see anything that may be of a size smaller than the smallest wavelength of the visible electromagnetic waves, that is, 390 nm. Though it is not that our eyes can see only the rainbow colors – we can see even other colors, such as pink or magenta, that are obtained by mixing electromagnetic waves of multiple wavelengths but the fact is – we can see only an infinitesimal part of the “whole spectrum”. As has been mentioned by Jade Roberts at https://www.quora.com/How-much-of-the-electromagnetic-spectrum-is-visible, since we don’t fully know what the full breadth of electromagnetic spectrum energy encompasses, we can’t tell exactly what percentage of the spectrum can be seen by us through our eyes. Though we can detect the things that are not visible to our eyes, we know – the visible part of the spectrum is just a miniscule of the entire spectrum. Some people have likened the whole width of the visible part of the entire spectrum as merely three inches of a measuring stick if the entire spectrum was as long as the distance between the Sun and Jupiter in comparison to what we cannot see but are able to detect. In other words what we are able to see is less than a trillionth of a trillionth of a percent if we kept in mind that, though we can view some part of the invisible part of the spectrum through night vision goggles since we have the technology of generating an image that the eyes may be able to see, we are not able to see even the waves our brains create through electrochemical stimulations that generate an image in our subconscious mind which we see in the form of dreams only – not through our biological eyes. Nonetheless it, too, does not bring our plight to look for him to an end. We have a vast option of looking for him among the things that go beyond the visible part of the spectrum though they told us that we can’t describe him in words. This, however, reflects more on the assumed inadequacy of the human languages – not on his existence. Let us not forget, they never told that he does not exist. Quite possibly, what we call “nothing” in common parlance, itself, may be the place of his hiding. Therefore, we have no other option left but to look out for him in what we raptly call “nothing”, in our day-to-day conversation. How do we know – what we think of as “nothing” is also “something”? Let us think of the strange phenomenon that the potency of a homeopathic medicine goes on increasing as we go on diluting the constitution of the medicine. According to this paradigm, the “most dilute form of the medicine” should be the “most potent medicine”. You may recall, even the allopathic doctors of Britain had pointed out how it could be at all possible that diluter form of a medicine may ever be stronger than its concentrated form be it – homeopathic medicine or anything? Though it defies the basic rules of science – who would deny that the potency of the homeopathic medicines is inversely proportional to their concentration? This, not only, brings us very close to the concept that there is nothing such as “nothing” in the universe it even draws on us that nothing else but the thing we have been hitherto thinking of as “nothing”, itself, hides the “God”. For instance, look at the size of the seed that grows into such a big tree as we see it as it grows out of a seed. Likewise, look at the size of the spermatozoa of a man that when unite the female ova grows into full human form that is able to breathe, that is able to eat, is able to digest the food, is able to think and take decisions of its own, is able to evolve things such as robots, computers, airplanes and what not – even so miraculous things such as Artificial Intelligence, rockets and spaceships. Actually, if the most dilute form of a homeopathic medicine can do wonders and such small things as seeds can grow into so big plants and so small things such as spermatozoa can grow into marvelous human bodies (and all sorts of creatures) – we should not doubt that the universes could have also born out of this infinitesimal “nothing” only. Science may never, perhaps, get into the entrails of this so obtrusive “nothing” but it holds the key of the existence of “God”. It explains why science has not been able to find God and may, perhaps never ever, be able to find out – either. And if you are skeptical about it – think of “zero” as “nothing”. We know, “zero” consists of two REAL PARTS – “Minus one” and “Plus one”. When “Minus one” is added to “Plus one” – we get “Zero”. So, we should not be surprised that “nothing” also consists of two REAL PARTS – “Positive something” and “Negative something”. Therefore, quite possibly, two types of universes – the “Positive universes” we can see with our eyes and the “Negative universes” we can’t see with our eyes should have borne out of this “nothing” only. There is every possibility – what has been conceptualized as “Parallel universes” maybe these very “Negative universes” only. Who knows – science is gasping for the so-called, souls only because they are, probably, domiciles of these “Negative universes” which repatriate to their respective universes when we die? It would also remain much of a mystery till we don’t make out the physical existence of what we know of as “Parallel universes”.